Tristan Knelange is a singer and choir conductor from Amsterdam, Netherlands, specializing in western classical and folk music. He holds a double bachelor's degree in history and philosophy as well as a master in musicology from the University of Amsterdam. Parallel to his academic education, he spent 5 years at the conservatories of The Hague and Amsterdam, studying voice and conducting, graduating with a third bachelor in music education. For the last seven years, Tristan conducted a wide range of choirs, from student choirs to church choirs, acappella as well large orchestral works, from gregorian chant to the most contemporary. In 2010 he founded Boeuf Majeur, an ensemble specializing in combining vocal music with modern performance practices, theatre, poetry and electronic music. Tristan is especially passionate about mentoring beginner singers in developing technique, musical skill and confidence through collective experience and learning. In this capacity, he works as a freelancer, teaching choir workshops for various organisations. 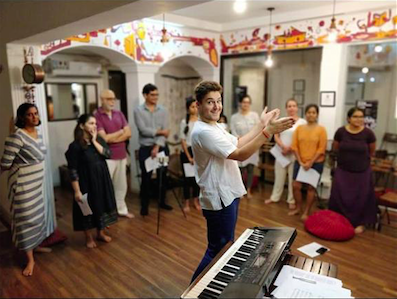 Dividing his time between Mumbai, Goa and Amsterdam, he is currently exploring musical practices in devotional chant across cultures, combining mantra, bhajan and kirtan with his own background in western classical and his love for pop, soul and folk music.